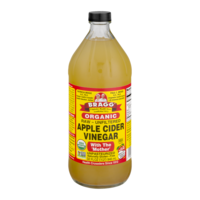 Bragg organic raw apple cider vinegar is made from the finest, delicious, healthy, organically grown apples. Raw apple cider vinegar is full of zesty natural goodness and contains the amazing 'mother' of vinegar which occurs naturally as connected strand-like chains of protein enzyme molecules and is highly regarded throughout history. In 400 B.C. Hippocrates, the Father of Medicine used it for its amazing natural qualities. Bragg's organic vinegar adds healthy, delicious flavor to salads, veggies, and most foods. Tasty even sprinkled over popcorn.Bragg organic vinegar drink:Delicious, ideal pick-me-ups at home, work, sports & gym. Perfect taken 3 times daily... upon arising, mid-morning and mid-afternoon.1 to 2 tsps bragg organic vinegar in 8 oz glass purified water and sweetening (optional) to taste, 1 to 2 tsps organic honey, 100% maple syrup, blackstrap molasses or 4 drops herb Stevia.More bragg live food products to try:Bragg organic apple cider vinegar drinks.Bragg all natural, [Non-GMO] liquid aminos.Sprinkle-24 herbs/spices Kelp seasoning.Bragg organic, extra virgin olive oil.Bragg nutritional yeast seasoning, 3 John 2.Bragg organic dressings & marinades.Organic apple cider vinegar & honey blend.As a natural product, color and flavor may vary.Certified Organic by organic certifiers.www.braggacv.com. Uncle Ben's Brown & Wild Ready Whole Grain Medley Pouch. "Perfect Every Time.Brown rice, wild rice & red rice perfectly seasoned with herbs & spice.Microwave in the pouch.Cooks in 90 seconds.